He’s a good little traveler, but keeping him entertained with a variety of travel-friendly toys is the key to avoiding meltdowns. 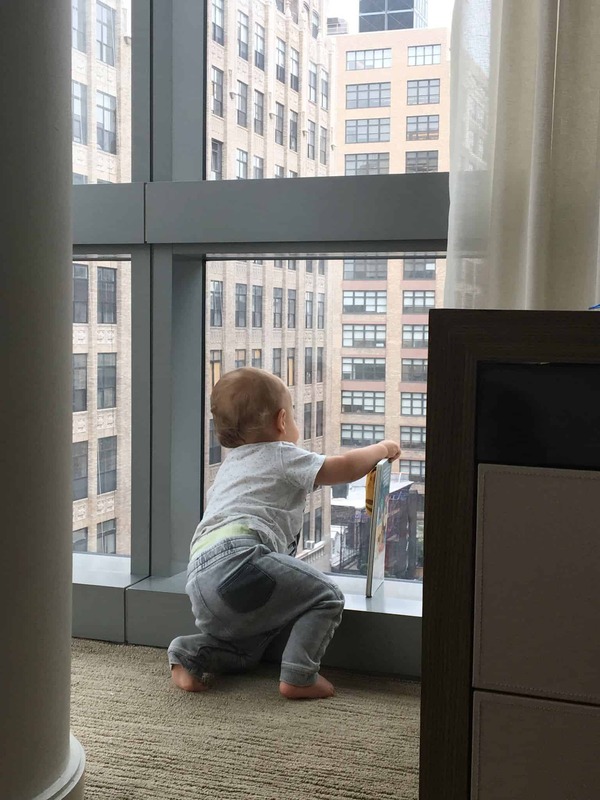 Heck, even the most seasoned adult traveler can find themselves bored to tears waiting in airports, on long-road trips, or stuck in an uncomfortable plane seat, so imagine how it is a for a restless, full-of-beans toddler. After countless road trips, and both short and long flights, I’ve compiled a list of the top 10 travel toys for toddlers. I had some fairly strict criteria for a toy to be included – it had to be lightweight, portable, mess-free, quiet (so it doesn’t annoy other passengers,) and have the ability to hold a toddlers attention for more than two seconds. This magnetic game is perfect for keeping a toddler entertained on a road trip, and a great way for toddlers to develop fine motor skills and practice color matching. Using the attached magnetic pen, the goal is to move the cars in and out of their parking spaces. Toddlers will love the bright colors and interactivity of this game. Find it here on Amazon. 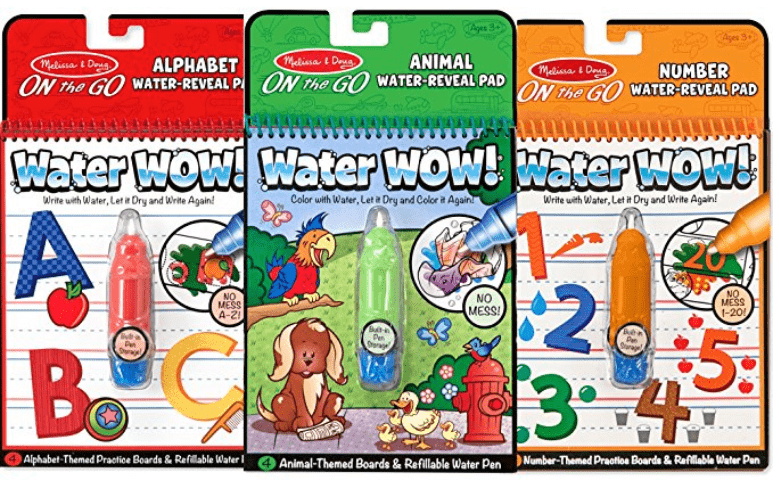 These Melissa & Doug Water Wow activity pads are a definite favorite of my 2-year-old and keep him enthralled for hours. Painting is always fun, but can be messy. These water activity pads take all the mess out of painting by featuring black and white line drawings that turn to color when wet. The pads come with a chunky refillable plastic paintbrush and a handy storage compartment on the front of the pad. Find them here on Amazon. With a zipper, handle and all pieces being tethered to the book, this toddler activity book is perfect for travelling. The My Quiet Book for Toddlers features 8 different activities for toddlers that help to develop fine motor skills, including a buckle to thread, laces to tie and a zipper to fasten. Find it here on Amazon. For plane travel, this foldable travel tray is a must-have item. It provides the perfect place for little ones to stash their toys and activities, with having items constantly rolling off the tray table. It features mesh pockets, a cup holder and adjustable straps, is machine-washable and folds completely flat. I didn’t have one of these for our first plane flight, and I was CONSTANTLY having to bend down and try to find missing crayons, toys, bottles of water, etc. Trust me, you need one of these if you’re flying with a child. See it here on Amazon. This WikkiStix Traveler Playset is an excellent, mess-free travel toy that will keep little ones entertained for hours. WikkiStix are bendable, moldable, reusable, wax coated pieces of string that seem simple, but provide hours of entertainment for children. The travel set comes with a carry case, 144 Wikkistix, a 12-page activity book, 2 activity sheets and a personal identification sticker. See it here on Amazon. Anything magnetic is a winner when it comes to travel toys for toddlers, and this jungle magnet faces game fits the bill perfectly. It comes with 5 different animal faces and endless combinations that kids will find hilarious. It comes with a metal storage case and is portable and small enough to fit in a diaper bag or backpack. See it here on Amazon. No list of the best travel toys for toddlers would be complete with the classic magnetic doodle board. Portable, mess-free and fun, there’s a reason why magnetic doodle boards have been a favorite for so many years. My toddler particularly loves this one because unlike traditional magnetic doodle boards, it contains four different color zones. See it here on Amazon. My husband and I have a running disagreement about Peppa Pig – he thinks the show is weird and doesn’t “get it,” I think it’s the funniest kids show on television. I think it’s the British humor that he doesn’t quite understand 😉 Regardless, my son loves Peppa Pig, so this Peppa Pig coloring pouch is a definite travel hit. It contains 2 pages of stickers, 24 coloring and activity pages and my favorite feature, an 8 color crayon wheel, which avoids having to pack multiple crayons (and have them constantly rolling away!) See it here on Amazon. 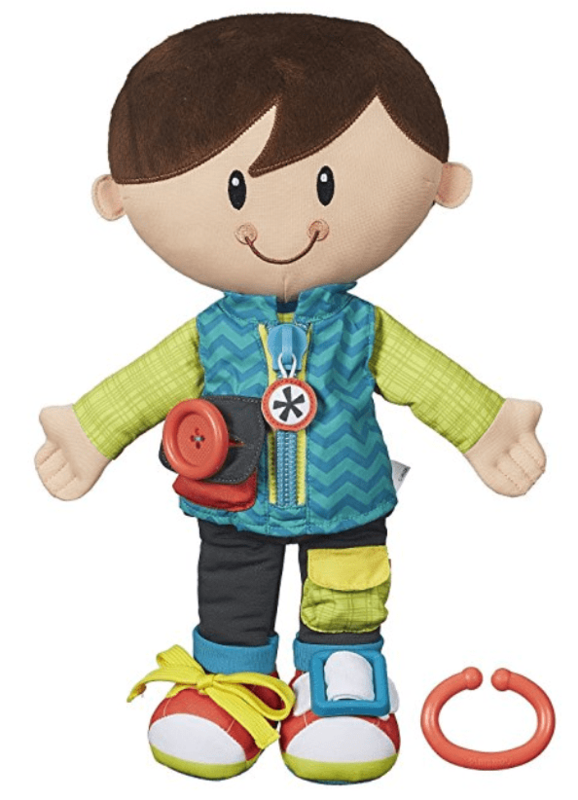 This adorable, soft, interactive doll comes in boy and girl versions and is perfect for keeping little hands busy. It has 5 activities that help to foster hand-eye coordination and fine motor skills, including a zip, button, buckle, fasten and tie. The dressy kids doll is small and portable enough to easily pack for travel, and is machine washable. See it here on Amazon. Reusable stickers are one of our favorite travel toys for toddlers – they provide hours of entertainment, are lightweight, mess-free, quiet and fun. Puffy stickers just up the fun-factor (is it just me, or are puffy stickers the ultimate type of sticker? haha!) 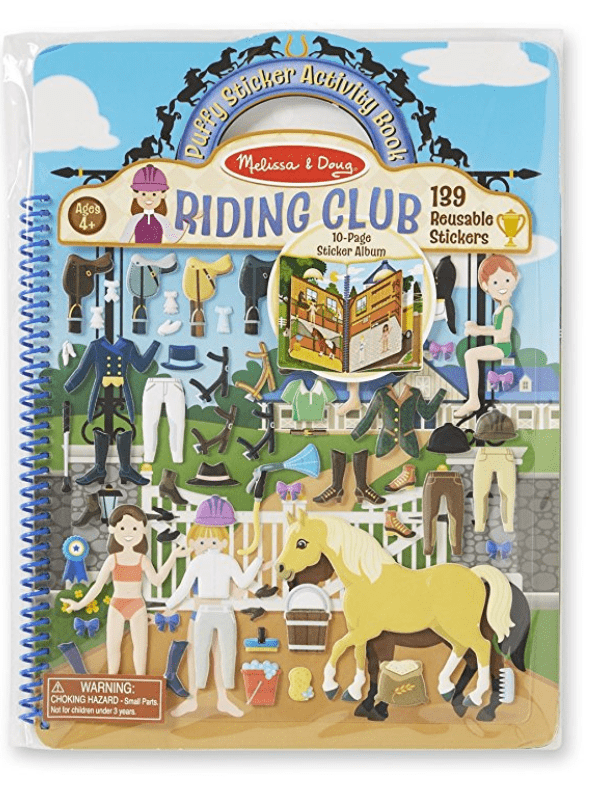 This Melissa & Doug puffy sticker activity book is small and portable, and contains 10 backgrounds, 139 reusable puffy stickers and features a convenient carry handle. See it here on Amazon.